Creative Robotics is an ISO9001:2008 Certified Industrial Automation Company. 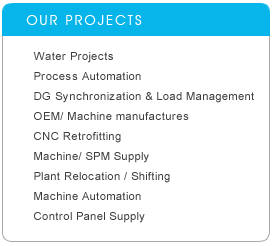 We offer World Class Automation Products along with our best Services. We have team of Engineers who have more than 100 Years of Combined Experience in the areas of Industrial, Process & Factory Automation to provide Quality and affordable solutions with value added Services. Creative Robotics has delivered Engineering based Solutions for Industrial Automation with Products as Programmable Logic Controllers(PLC), Computerized Numerical Control(CNC), Motion Controllers, Various Drives as Servo, Stepper & Variable Frequency Drives, Human Machine Interfaces (HMI), Supervisory Control & Data Acquisition (SCADA), Telemetry SCADA, Vision System, Robots, Building Automation System(BAS), Building Management System(BMS) etc. 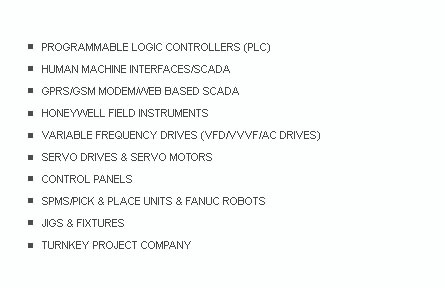 Creative Robotics has State of Art PLC Panel, VFD Panel, Power Panel and SPM Manufacturing and Assembly Shop. We have Strategic alliances with world-class companies, Pioneers in their chosen products as Honeywell, Omron, BALDOR (Member of ABB Group), Remmon-Isareal, GFR-Germany. From Our Alliances and our Extensive Industrial Experience along with our Manufacturing Set up, We are capable to offer Solutions from Design (Concept) to Commissioning (Reality) in the field of Industrial Automation. Today we can proudly say that we are perhaps only Company in the Globe who have developed Expertise in all Industrial Automation Products including PLC, PLC Networking (Devicenet, Profibus, Profinet, Compobus, Wireless, GSM/GPRS Connectivity), CNC, Motion Controllers, Robots, HMI, SCADA, Vision System, Building Automation System(BAS), Building Management System(BMS) etc.